Moving. Nobody enjoys it, but it’s just something we do more nowadays than in times gone by. I was ahem, lucky enough to move twice in 4 months, the first one an 800 mile trek from New Hampshire to North Carolina! Talk about an adventure! In this article, I’m going to briefly share some frugal tips for moving and share with all of you ways that Sam’s Club can make a move easier on your wallet! Boxes: DON’T BUY THEM! I went to grocery stores, department stores and even asked on local FB groups if anyone had boxes I could reassemble. They are crazy high prices per box at office supply stores. Most places were happy to let me take them all off their hands. Your biggest expense would be a little gas to go around and collect them and then packing tape to reassemble them. Don’t spend extra cash on bubble wrap: While I would definitely recommend saving any you come across when you receive packages leading up to the move, wrap your dishes and other fragile items carefully in washcloths and towels. It sounded kinda nutty to me when my husband suggested this. He has moved around multiple times and swore it would be fine. Amazingly, we arrived in NC with just one broken glass out of dozens. I was picturing replacing all our dishes upon arrival. When you arrive: It’s a great chance to do those spring cleaning chores we all have every intention of doing every year, but just don’t around to it. Do some deep cleaning, change those smoke detector batteries and change the air filters. One Stop Shopping: Consider checking out your local area Sam’s Club for one stop shopping and deals on all those household items you’ll need at your new place. Sam’s Club offers tons of instant savings promotions monthly with no coupon clipping required! Those Air Filtrete Filters by 3M I mentioned above are $8 off through 11/25. 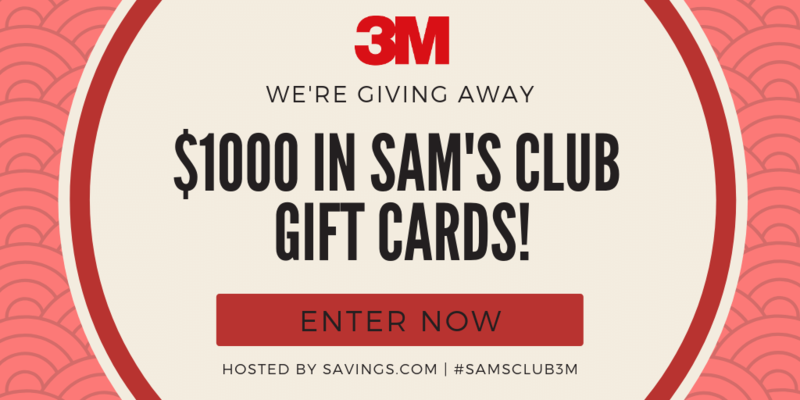 Shopping Spree: Win one of 10 $100 Sam’s Club gift cards! Giveaway is powered by Savings.com. Sale For Online Tax Filing At H&R Block!! WOW!! 100% Free Flight With Expedia! New Ibotta Offers – Sara Lee, Tyson, Zarbees & More!